Radioactive material is found throughout nature. Detectable portions occur naturally within soil, rocks, water, air, and vegetation, from which it is inhaled and ingested to the body. 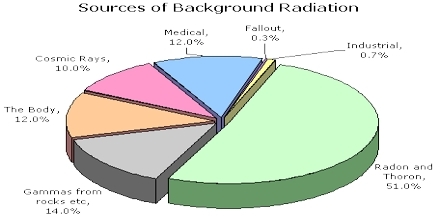 Background radiation is the ubiquitous ionizing the radiation that people on the globe Earth are exposed to, including natural along with artificial sources. Both natural along with artificial background radiation varies depend on location and altitude.